Cardiac or heart bypass surgery is an open-heart surgery which is performed to repair the damaged arteries of the heart that supply blood to its muscles. The internal mammary arteries are the components of the heart that works to supply blood to the breastbone and the chest. The most important artery of the heart is the internal mammary artery commonly known as the LIMA and is believed to be the favorite artery for most of the topmost cardiac surgeons. The reason attributed to this favoritism is the high success rate of the surgery with the use of this artery. Moreover, under various scenarios depending on the heart conditions of various patients, at times even veins from the legs known as saphenous and radial artery from the arms are used during the surgery to meet different needs of individual patients. The surgeon operating further joins or grafts these veins or arteries and this, in turn, improves the blood flow bypassing the blocked arteries of the heart. When there is a heart attack and you feel restless while your body temperature cools down. When you have severe chest pain due to the shortage of blood in the heart muscles because of narrowed or blocked arteries. When you have one or more diseased coronary artery. When your left coronary artery is blocked or narrowed down. 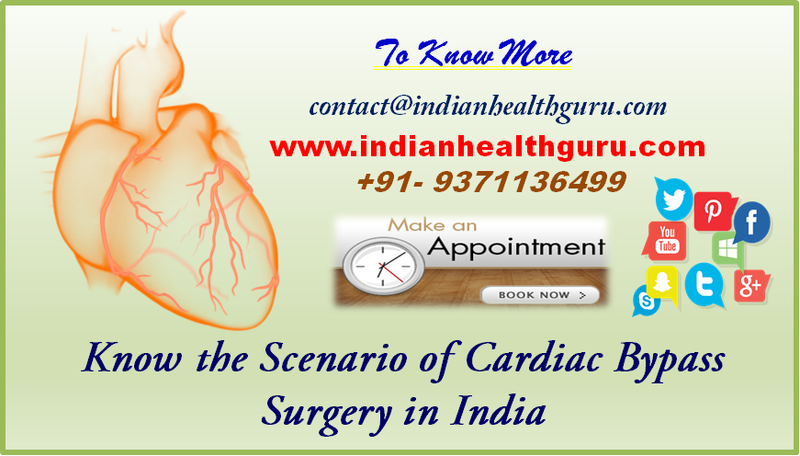 Low-cost cardiac bypass surgery in India in world-class hospitals across various cities like Goa, Kerala, Chandigarh, Delhi, Mumbai, Bangalore, Hyderabad, Pune, Kolkatta, and Chennai. The cost of a Cardiac bypass surgery is so much more affordable in India than all the western countries. Though the overall cost of the surgery depends on a number of factors and accumulates to be somewhere around $5500, an average patient traveling from the UK, US or any other foreign country still saves around 70 to 80 percent of the amount than if they would have undergone the same surgery in their home country. The Indian health guru will connect you with the best hospitals and surgeons in the country for your cardiac bypass surgery. Additionally, we provide all the consultation online so that you are prepared and completely aware of what to expect when you will arrive in India for your treatment. You can contact us by filling an online form or calling us directly on the number given on our portal. You just have to get in touch with us through any medium you feel comfortable and rest leave all the worries to us. Indian Health Guru will take care of all the other arrangements like sourcing the best surgeon, assisting in travel and hotel accommodation, and then taking care of the entire process of surgery starting from pre-evaluation to post-surgery care. «Best Eye Surgery Hospitals Of India: Why Global Patients Consider Them For fixing their different optical issues.